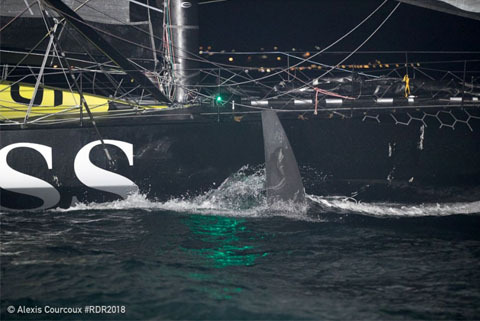 First pictures of Alex Thomson’s Hugo Boss show signs of what appears to be superficial damage along his starboard hull with gouge marks from his grounding on the north end of Grande Terre clearly visible at the stern, on the foil and at the bow. 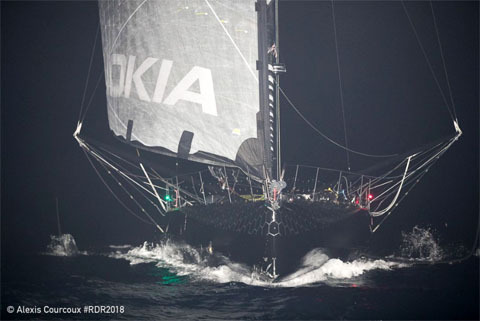 Thomson is completing his race having had to start his engine after hitting rocks and is now about 30 miles from the finish line but making only around two knots in the light winds during the hours of darkness. He and his team are evaluating the damage to his boat and there is no word yet about what may have happened below the waterline. As the British skipper tries to complete his victory, the focus will switch to the race jury who will have to decide whether he should receive a time penalty for using his engine, albeit it in an emergency and in a situation when safety concerns were clearly paramount. Behind Thomson on the racecourse there is still a big gap to second-placed Paul Meilhat on SMA who had 190 miles to run but was still travelling at 17 knots. He is expected to slow down once he gets closer to the islands. Just under 20 miles behind him Yann Eliès on UCAR-Saint-Michel is holding third place. The next finisher in the Multi50 class after winner Armel Tripon (Réauté Chocolat), is expected to be Erwan Le Roux on FenêtréA-Mix Buffet who had only 50 miles to go to the finish. Way back east meanwhile, Yoann Richomme on Veedol-AIC still looks comfortable at the head of affairs in the Class40 fleet with a margin over second-placed Phil Sharp (IMERYS CLEAN ENERGY) of just over 100 miles and with 1,080 to go.